• DESCRIPTION: Limited Variant Cover. "War of the Iron Men" Pt. 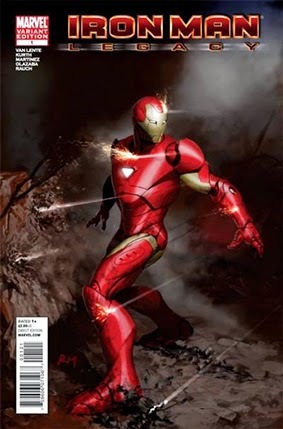 1 - The Armored Avenger's second on-going series kicks off with a bang as the WAR OF THE IRON MEN begins here! Tony Stark's worst fears are realized when stolen Iron Man technology is used for ethnic cleansing in a civil war-ravaged land. When he defies U.S. government orders to confront the armored assassins himself, Stark sets off an international conflagration that threatens his friends, his company, and his very life -- and sets him on a collision course with China and Russia, and their champions, Radioactive Man, Titanium Man and the Crimson Dynamo! Guest-stars galore! And a shocking last page reveal of the classic Shell-head villain behind it all you won't want to miss! Written by FRED VAN LENTE. Art by STEVE KURTH. Variant Cover by RYAN MEINERDING.